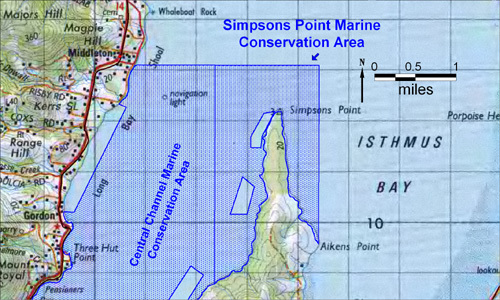 The Simpsons Point Marine Conservation Area occupies 573.9 hectares in the D'Entrecasteaux Channel surrounding Simpsons Point, on the northern tip of South Bruny Island. The reserve encompasses sheltered habitats influenced by relatively cold and dark water currents, which has resulted in an array of interesting and unique habitats and invertebrate communities normally found in deeper waters. Reef habitats off Simpsons Point support seawhip beds, sponges, and animals such as spiny pipehorse (Solegnathus spinosissimus), Tasmanian numbfish (Narcine tasmaniensis), ringed puffer fish (Omegophora armilla), and the rare and endemic seastar (Smilasterias tasmaniae). The area is also a nursery and refuge area for sharks and supports scallop beds and highly localised flora including species such as Schizoseris tasmanica, an endemic red alga.